The Natural and Medical Sciences Institute (NMI) in Reutlingen, Germany (www.nmi.de) is a research institute which produces high-quality MEAs using utmost biocompatible materials. The NMI and Multi Channel Systems have collaborated on many projects and over many years. The MEA production is ISO 9001:2008 certified, so quality controls and standardized production processes ensure that the MEAs are always of excellent and consistent quality. In order to supply MEAs for all different types of recording systems and to cover as many applications as possible, Multi Channel Systems has plenty of MEAs in its portfolio. Please click on the description tab above and learn more about our different MEAs. These MEAs fit in MEA2100-Systems, the MEA1060 amplifiers, and the USB-MEA256-System. The electrodes are coated with titanium nitride (TiN), a very stable material, which guarantees that the MEAs can be reused several times. The majority of the MEAs have glass carriers, which facilitate the examination of the sample under any upright or inverted microscope. Tracks and contact pads are available in opaque and transparent versions and most MEAs have internal reference electrodes. Custom layouts are possible. Please contact us with your request. When doing in vivo/ex vivo recordings, flexible MEAs are the ideal solution. The elctrodes of FlexMEAs are imbedded in a thin and very flexible polyimide foil. This flexibility allows the attachment of the MEAs tightly to the surface of brain or heart preparations. FlexMEAs are available with 24, 36 or 72 electrodes of gold or titanium nitride (TiN) on polyimide foil and are the perfect solution for recordings from several species, in both acute and long-term chronic experiments. Culture chamber interface with lid for MEAs with plastic ring with thread. Additional or replacement interface ring for MEA culture chamber. MEA culture chamber for 60-6wellMEAs with round/triangle chamber ring. Set of 5 MEA culture chambers for 60-6wellMEAs with round/triangle chamber ring. - The culture chamber ring for 6wellMEAs is suitable for the round and triangle chamber ring to use it as a culture chamber. - A membrane sheet needs to be fixed over the 6well-CC. Removable membrane cover for MEAs with glass ring. 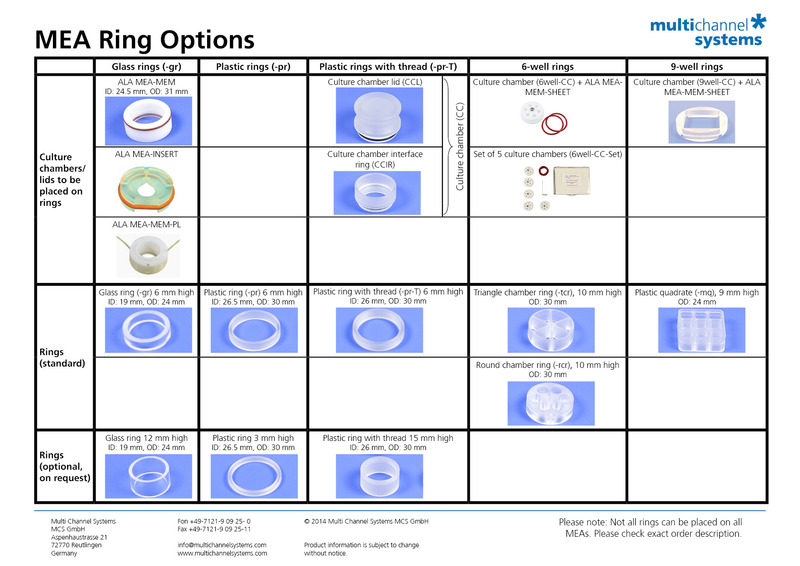 Set of 5 removable membrane covers for MEAs with glass ring. Tool for positioning the membrane on the ALA MEA-MEM culture chamber. Set of 10 membrane sheets for sealed MEA culture dishes. Removable membrane cover for perfusion of MEAs with glass ring. Set of 5 removable membrane cover for perfusion of MEAs with glass ring. Insert for MEAs with glass ring for applying minimal volumes of solution. Harp slice grid, nylon mesh, weight 0.4g. Harp slice grid, nylon mesh, weight 0.8g. Harp slice grid, polyimide-coated silica fibers, weight 0.4g. Harp slice grid, polyimide-coated silica fibers, weight 0.8g.